It’s A Custom Wallpaper Mural! D’ya see that window overlooking a golf course? Doesn’t it look so real? And serene? It makes you (well…my hubby) want to drop everything, go outside and play a round. It’s not even a wall decal. It’s actually a custom wallpaper mural! Seriously! And trust me, these wall murals are so realistic, people will walk right up and have to touch it to believe it’s not real. 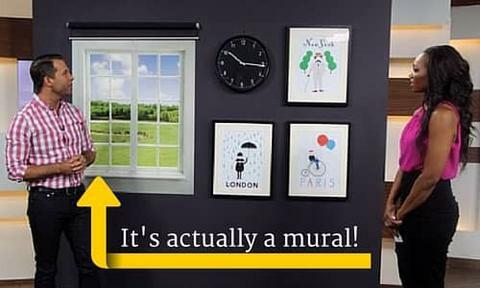 Yup, my supplier and their amazing wall murals have been featured on TV again. This time, Tracy Moore (of CityLine) and Celebrity Designer, Yanic Simard, talk about how to deal with an off centre window. I can help you create your own custom wallpaper. Can you imagine a full mural featuring your favourite golf course (or beach or village square)? Maybe you don’t care about places, but it’s the people you like to surround yourself with? You could have a favourite photograph of your family…maybe 4 generations together…or maybe you and hubby holding your new baby. Whether from your own photograph, painting or a stock image found online (which I can help you with), the possibilities are endless. What do you think the best kind of custom wallpaper mural is? A piece of art you created?